That's the title of the latest selection brought to this little corner of heaven by the friendly folks at Netflix. Yours truly figured it couldn't be half bad, especially given the all-star cast. 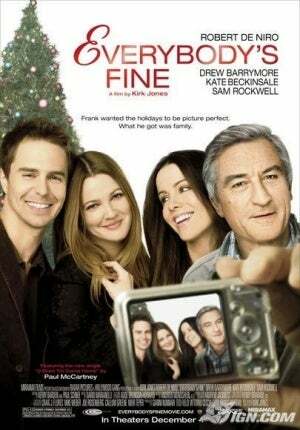 It includes Robert DeNiro, Drew Barrymore, and Kate Beckinsale. More importantly, it has a good premise that allows for great character development. And, that's a fairly rare commodity in this era of special effects and computer-generated piffle and nonsense. Basically, a recently-widowed father plans to have his 4 adult children visit for the weekend. But, they all back out at the last minute. So, he takes it upon himself to travel across the country to visit each of them. I won't ruin the cinematic experience for ye socks by revealing what he discovered in the process. Bottom line: worth the rental.